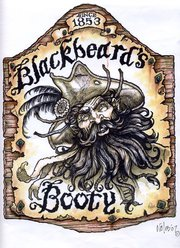 Pirate Artist Michael Noles; designer of the Blackbeard’s Booty Rum label, is a graduate of Ringling school of art in Sarasota Florida, where he received his BA in fine arts. He continued his schooling at the University of Gainesville for his master’s degree. Michael Noles has worked as a designer & consultant in the theme park industry for a few decades as well as sculpting the full size Jaws shark at Universal Studios. 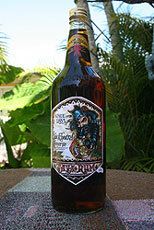 He has held a 33yr contract as Sr. Art Director & Designer for Disney World, Orlando. His partial client list includes: Walt Disney - Florida & France, Ringling Clown College – Japan, Universal Studios – Orlando, Six Flags over Georgia, Macy’s - New York, Revere Studios - Orlando / Dubai. Michael’s personal works of art has been shown and sold around the world. Disney commissioned him to create a bronze statue to be presented to King Renier of Monaco. His "High Seas Collection" has hung at the Customs House Museum in Key West, Historical Museum Orlando, Mel Fisher Museum Key West, Pirates Dinner Theatre Orlando and Old Port Exchange in Portland Maine. Michael created a sculpture after the 9/11 disaster entitled "Lest We Forget" of a firefighter pulling our flag out of the rubble. All were hand painted and numbered. 40 of the sculptures were sold to private collectors, and the remaining majority was purchased by fire stations around our nation. 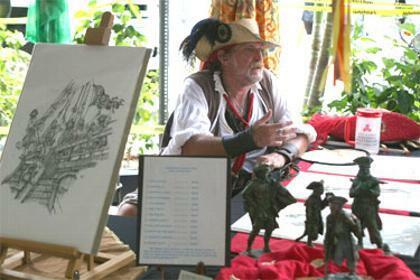 He sculpts in stone and wax and has done various bronze pieces as well. Michael’s "High Seas Collection" a collection of Limited addition prints & sculptures that are signed & numbered by the artist will be available for purchase and Michael will be present to autograph purchases of this collection.